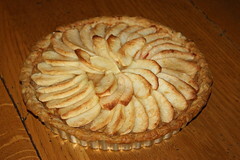 The French Apple Tart is a tart filled with kind of a home-made apple-sauce and the usual apple slices on top. It takes some time because additionally to the shell you also have to do the apple-sauce. But it is very simple and the result looks great! I made half the recipe and got a small tart (but still about 8 slices or 12 very thin slices) and an individual tart. I could have used a bit more sauce - I used three apples, one very big one, two normal ones, and it was fine, but more would have been also ok.
Baking time was a bit longer than the recipe tells, what is unusual. It was more like 40 minutes. But I only slightly pre-baked the crust so maybe that's the point. I brought it to the office the next day and absolutely everybody fell in love with it! 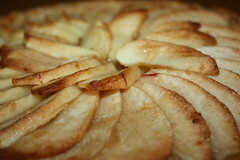 I wouldn't say it looses over night, but for sure, a warm apple tart is always extraordinary as well. If you want to find out about the recipe turn to Gaye's blog "Law of the Kitchen" or have a look at the book by Dorie Greenspan on pp 379-381. Very pretty Apple Tart! Totally delicious looking!! Lovely photos! Beautiful tart! I love the color you got on the edges of those apples. Very lovely! Wonderful looking tart. And how lucky for your coworkers to get to sample it!! I liked the tart the next day. I think it was fine if not better. 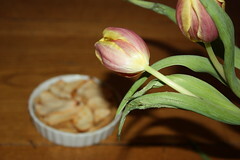 My baking time was longer as well...though it always seems to be longer than what the book calls for. Very lovely looking French Apple Tarts with very pretty toppings! I am sure that your co-workers were more than pleased when you brought it to the office the following day! Your tart has lovely browned edges, well done. Your coworkers are lucky. Great looking tart. Lucky co-workers!!! I thought this tasted better the next day and even the next! COngratulations on dough success. Pie/ tart dough can be so tricky - it feels like such an accomplishment when you get it right.